Have you ever baked with Extra-Virgin Olive Oil? Most of us think of using olive oil in dressings, salads or as a condiment for dipping bread of crudite. You can substitute olive oil for any recipe that calls for butter or margarine - even cakes! These Basil Pesto Muffins are going to change the way you use olive oil. They have all the flavors of basil pesto - fresh basil, Parmesan and garlic - They are perfect as a snack or in place of garlic bread with nearly any pasta or meal with Italian flavors. I can remember my mom using this olive oil and remember the distinctive bottle it came in. Pompeian has been bringing the flavor of Tuscany to our tables for over 100 years! The flavor is rich and fruity with true Italian flavor. The folks at Smiley360 sent us on a blogger mission to enjoy the taste of this fine olive oil. 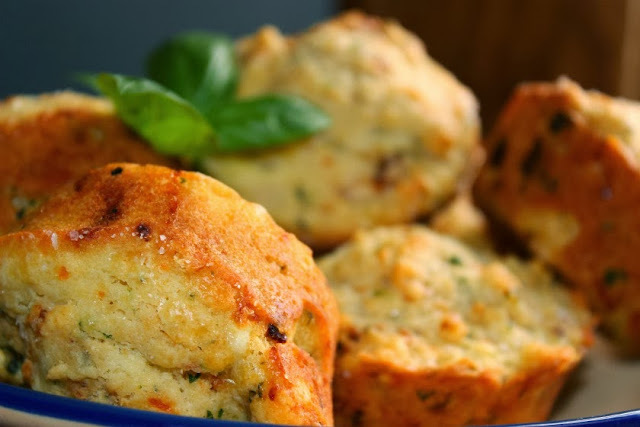 For the best tasting muffins, be sure to use Pompeian Extra-Virgin Olive Oil, and shred your Parmesan from a wedge rather than using preshredded. 2-1/2 cups all-purpose flour 2 tsp. baking powder 3/4 tsp. salt 1 cup Pompeian Extra-Virgin Olive Oil, divided 3/4 cup whole milk 2 eggs 1 cup packed fresh basil, chopped 1 cup shredded Parmesan 1/3 cup sun-dried tomatoes, chopped 2 cloves garlic, minced Coarse sea salt Preheat oven to 350 degrees F. Coat a 12-cup muffin pan with nonstick spray; set aside. Whisk together flour, baking powder and salt in a large bowl; form a well in the center. Combine 3/4 cup Pompeian oil, milk. and eggs in a measuring cup until eggs are lightly beaten. Pour mixture into well of dry ingredients; stir only until dry ingredients are moistened. Fold basil, Parmesan, sun-dried tomatoes, and garlic into batter just until evenly distributed. Scoop batter into each muffin cup filling two-thirds full (about 1/3 cup). Drizzle 1 tsp. remaining olive oil over each muffin. Sprinkle sea salt on top of each muffin. Bake muffins until a toothpick inserted in center comes out clean; 20-22 minutes. These muffins are also great for brunch or snack sandwiches. 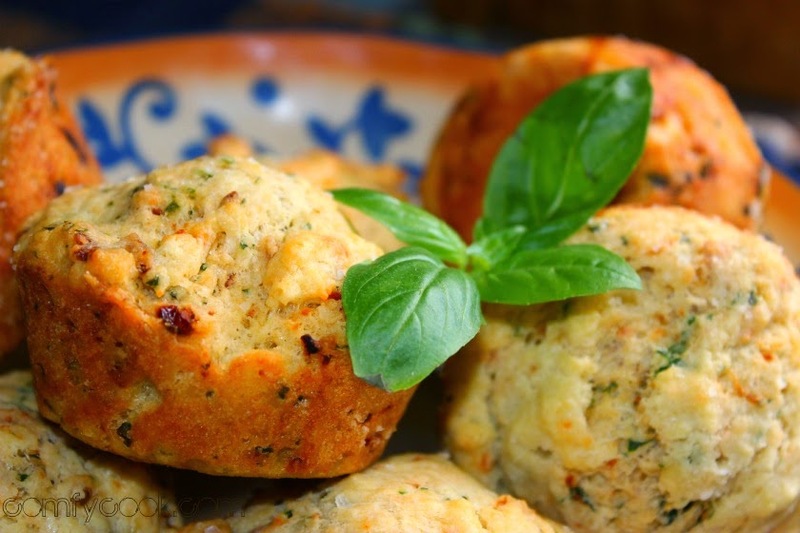 Split muffins and fill with fresh tomato slices and mozzarella cheese. Broil muffins for 2-3 minutes to melt the mozzarella and top with sliced tomato! To learn more about Pompeian Extra-Virgin Olive Oil, click here. Don't forget to click below for your $1.00 off coupon! Click here to try any Pompeian Olive Oil with this $1.00 off coupon! "Like" Pompeian on Facebook for more coupons and the latest news! Complete this quick survey to win a chance for a $200 gift card! Disclosure: I have received a sample of Pompeian Extra Virgin Olive Oil from Smiley360 for free.